Skype | The difference is in the detail. Today is the first day I have the courage to visit my blog again. Three weeks since I left my last entry and I am still not sure I have anything creative to say even though I have had a lot on my mind over the past 3 weeks.. But maybe writing about some of what ‘s on my mind will help even if it is not the most inspiring piece. I have stood at an open grave for the first time in 14 years…. and for the first time ever at someone’s in my immediate family. My Mom. My mother has lived with Alzheimers for the past 7 years. She was only 67 years old when she was diagnosed. There were definite markers in her journey where you knew that she had entered a new phase. After every decline, a considerable period would follow where she would be in that new “state of mind”. Sort of like taking one step down a ladder, but then staying on that step for quite a while..nothing significant changing…but all those around the patient knew that things are not quite the same as it was on the step just above….. Throughout all of this she had been in good physical health though. Her mind going, but her body remaining strong…. While being in one of the most beautiful places on earth, Halong Bay, Vietnam (considered for one of the NEW wonders of the world 2010)…. I got a call from my husband. Telling me that my mother’s health took another turn. This time it was not her mind, but her body…or differently put….her mind shutting down her body. She stopped taking in food. This time the turn in her health lasted only 3 days…. and only a day after I learnt about it…. On my flight back from Vietnam, she passed away. From the airport I left to get my clothes, my husband and kids and then returned straight back to the airport to take on the 20 hour journey home….. to be with my family. Her journey with Alzheimers was a long one…and still her death came unexpected and sudden. I have tried to prepare for that day over the past 7 years….ever since the day I realized that her diagnosis was marking the beginning of an end…. This does not mean, in any way or form, that it is less painful to finally face the facts when reality brings you this news. I experienced somewhat of a zombie state for a while where the world became a blur and where you turn to your most basic needs and emotions and that’s it. Anything beyond that simply does not matter for some time – one of those being a blog…. The moment somebody dies, every image, every conversation, every interaction with that person exhanges into a memory. Everything present becomes past. For that person that is where it all ends here on earth. For you, and all those staying behind….. that is where a new era starts – one of remembering… a new challenge of how you are going to deal without that person, a feeling of insecurity of how the “new you” will cope with that part of your existence and being taken away… A friend told me losing your mother is like having one of your security cushions taken out under you…. The mere thought that you are now in this world alone without a mother… Even if she was not mothering you anymore….. And at the same time you are dealing with the comfort and peace of knowing that she is released from this world, from the claws of an illness that took her captive and that she has been restored to full glory in Heaven. I had no unfinished business with my mom. During her lifetime she did all she could for me and I did the same for her. She wrote me tons of little notes and letters and told me how much she loved me. I did the same. A couple of weeks ago, I recorded a telephone “conversation” or rather “interaction” we had via Skype. My dad took the computer to her place of care so I could see her and hear her voice. Not knowing that this would be the last time ever that she would speak to me…..I ended saying that I loved her…and she said that back to me. After having a conversation which made no sense whatsoever and in which she did not respond directly to anything I said, that was a truly amazing response and I felt so happy. I recorded that conversation…why – I dont know….but today I have that and I feel so blessed. So when time came to say goodbye, and I could not be with her, it was a blessing to know that there was nothing more that I could have said or done for her in her final moments. 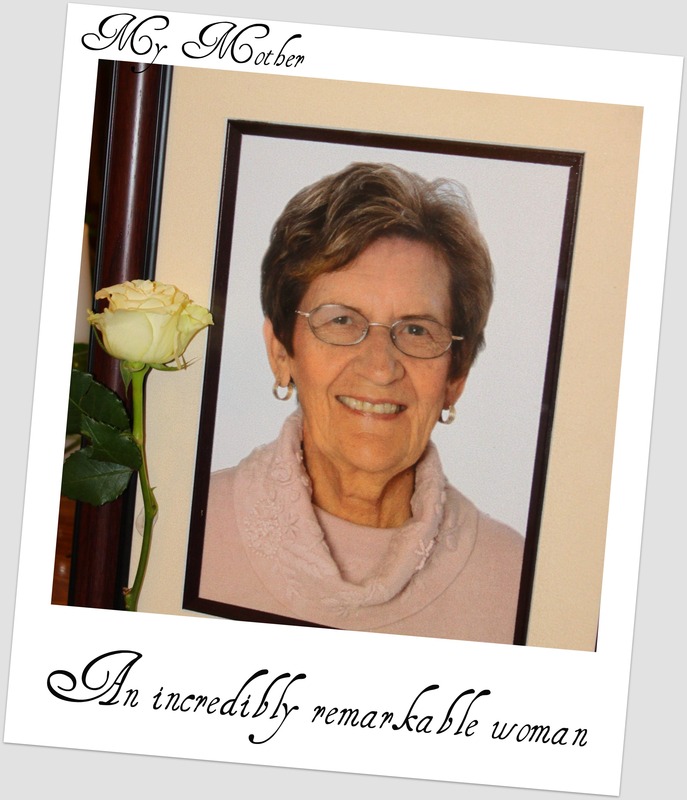 My mother was an INCREDIBLE and REMARKABLE person! Everybody knew that and talked about that – in her life and after her death. What an amazing priviledge to have been the daughter of such a remarkable women. What a blessing to have had a loving, caring, unselfish, chirpy and cheerful mother who did not only look after her own family, but who was a mother to every needy, sick, homeless or illiterate person while taking her place full on as the wife of a prominent husband in the community, filling her days with nothing but meaningful, solid relationships with so many people and God. LIfe is not accurately measured by the number of breathes you take, but the number of lives you’ve touched. What a life she had…measured in that means !!!! It is during a time like this, that you feel the love and the support from your friends and your community. We can not face these times alone and it was just a wonderful thought that I could just be still and know that there were so many who had us in their thoughts and prayers. It is in times like these when friends matters…Thank you to each one who was there for me….. I was reminded again of a few things about my family during this time… we stick together, we have a good sense of humour, we have forgiven each other a lot over the years and the impact my mother had on each of us is enormous…. she lived life to the fullest…she gave life to all of us…she loved each of us unconditionally and her life was more important than her death… the way it should be. – tell those you love, that you do…today. – have no unfinished business with anyone – you never know when a life ends…and then it will remain unfinished forever. – care for others while you can and they will care for you when you loose your ability to care for them or yourself. – be part of a community. They will carry you through the tough times. – live life to the fullest…making the most of what you have… while you have the ability to do so. WHEN LIFE GIVES YOU LEMONS, MAKE LEMONADE… My mom lived by this. I will miss her, I will remember her… . but she LIVED a LIFE worth celebrating, worth remembering…..